On this Garden Bloggers Bloom Day here in western Massachusetts I am ready to celebrate annuals – and others – who have survived the rains of this summer. Look at this sunny nasturtium – a volunteer from last year who swam happily this year through the summer. are always stalwart and shining. The bees love them and are grateful for their long season. There are a couple of other other potted (nameless) annuals that also keep us cheerful. This cheerful annual in front of the yellow twig dogwood found out it knew how to swim. This geum, blooming next to the scaveola must have been inspired – enough to put out a couple of new blossoms. This variegated Joe Pye weed is in full bloom – finally. The Fairy” rose will stand in for the other roses still putting out occasional blooms. “The Fairy” is just tough and remarkable. The three hydrangeas are in full glorious bloom, but they are bowed low by all the heavy rains. Though not strictly in bloom, the red (and gold) winterberries have really enjoyed all the rain. We are swamp plants, you know, they remind us. I thank Carol over at May Dreams Gardens for hosting the wonderful Garden Bloggers Bloom Day. Visit Carol and see what else is in bloom over this great land. 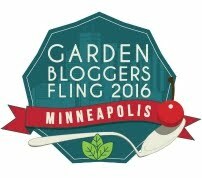 Happy Garden Bloggers Blooms Day. You have a lot going on in your garden! Thanks for sharing. That Scaveola is really pretty and it did so well in your garden. Makes me want to try it next year. Happy GBBD. Lisa – The scaveola is pretty – and tough – and ever blooming. I plan to include it again myself. I always get excited seeing any of my flowers succeeding in blooming and I love seeing the progress of others, too. What a wonderful mass of autumn colors! Betty – good to hear from you. Success is always thrilling – even if bits of failure live in our own gardens.